We’re looking forward to the opportunity to work with Beacon Interfaith Housing Collaborative as well as Better Futures Minnesota on Great River Landing! It is always fun to have the groundbreaking ceremony as it is demonstrates the start of new beginnings. 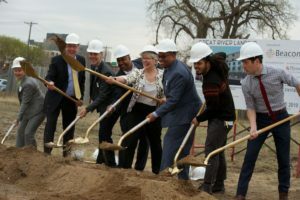 For Great River Landing, it is the beginning of construction and new housing for people in need of affordable housing. We are grateful to play a part in this project!